Anyway, I've enclosed two images this time; one which sums up how I feel about riding a bike to work in LA, and the second (thanks, Geri) which supposedly solves the secret...was Bush wired or not? Who cares, though? The people supporting him are hardly literate, and if he was wired for the debates, they should fire whoever was prompting him. George Bush has squandered a wealth of sympathy around the world towards America since September 11 with public opinion in 10 leading countries - including some of its closest allies - growing more hostile to the United States while he has been in office. BBC News Online looks at how US foreign relations may be affected by the outcome of the presidential election. But you know, my fine friends over the borders, that not all of us are about that, especially in California. 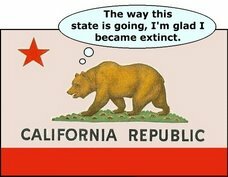 REMEMBER us poor folk in California on 2 November, when you see how different we are. Kerry's America knows that the rest of the world exists and that it is right about things that may be unknown to Inside America. The federal government's "no-fly" list had 16 names on it on Sept. 11, 2001. Today, it has more than 20,000. By Michael McCarthy The Independent U.K.
By Andrew Osborn The Independent U.K. So in the spirit of UN Day, I lift a small toast to the Russian bastards who forced my family out, thanks for saving the globe, one baby step at a time. This country is regressing into the 19th century of President Monroe and President Polk, when we took what we wanted. Europe? What Europe? Farmers, consumers, chefs and environmental groups have joined voices loudly and stubbornly to oppose bioengineered foods. The Ministry of Defence denies reports a secret deal has been struck to allow the US to station missiles in the UK. Arguments for and against Turkish EU membership are considered by BBC News Online's Paul Reynolds. Okay, that's my spiel for today. Operation Opt Out, a campaign of CAMS (Coalition Against Militarism in our Schools) ends with a joyful celebration and Youth Speak on Friday October 29th from 6-9 p.m. at the CARECEN- Central American Resource Center, 2748 West 7th Street ( just west of Hoover) in Los Angeles. Hear about the creative activities held at schools and in the community to inform students and parents about the option for juniors and seniors to Opt Out from having their private contact information released to the military. Hear about student activism and collaborative efforts with the peace and justice community. And join us in developing a broad based further response to the militarism in our schools. Join Ron Kovic, Vietnam Veteran, author of Born on the Fourth of July, student leaders Alex Herrera, Guillermo Tejeda, Audrey Castellanos and more, spoken word artists and Fidel Rodriguez of KPFK Divine Forces Radio. For everyone concerned about the growing intrusion of the military in public education. Let’s join together to create and present positive, life affirming alternatives for youth. And that means ANY war...WAKE UP! Poland's ambassador to Germany, Andrzej Byrt, said the decision was "a reaction to the actions of the Prussian Claims Society." The expellees' lobby group, led by Rudi Pawelka, is currently planning a string of international lawsuits aimed at returning property and assets to ethnic Germans who were forced to flee Poland in the millions after World War II. "Mr. Pawelka and his consorts started this debate, he's unleashed dramatic fear among Poles," Byrt told a German newspaper over the weekend. Despite the parliament's decision, Byrt said he did not believe the Polish government would actually make any official reparations demands of Germany. "The Polish government considers the question of reparations to be finished," said Byrt. In Berlin, politicians have been astounded by the Polish parliament's demand, and the Polish government has called for a diplomatic solution between Berlin and Warsaw. In a newspaper interview, the German Social Democrats foreign affairs spokesman, Markus Meckel, said he was greatly disappointed by the vote. And the press department at the chancellery in Berlin repeated previous statements from Chancellor Gerhard SchrÃ¶der that both countries consider the question of reparations settled. East Germans said they didn't want to live in a united Germany. It's not exactly a glowing testimony about the progress made in the 14 years since the Wende, the term used here to describe German reunification. Stereotypes about East and West are stubborn. East Germans think of westerners as "Besser-Wessies," or arrogant know-it-alls. West Germans, in turn, roll their eyes about the "Jammer Ossies," or whining easterners. "East Germans have a false perception of affluence in the West. They overestimate the level of prosperity, and take the upper income level as the average, so many of their demands are unrealistic," says Klaus SchrÃ¶der, an expert on the former East Germany at Berlin's Free University. "West Germans are envious when they see how much money is being transferred to the East. Many people feel that the true cost of reunification is being hidden from them." Negative western stereotypes about easterners have even been passed down to the younger generation, to those who were teenagers when the Wall fell. There's been an exodus of young easterners to western cities in the 14 years following reunification, but those who've remained in the East are often pegged as lazy, unmotivated, and bitter about their future prospects. Those assumptions are wrong, say sociologists at a leading public opinion research institute in the southern German city of Allensbach. They quizzed 2,000 Germans on their attitudes on typically Western values. While they concluded that, in the East, values such as equality and social justice ranked higher than individual freedom, the researchers admit they were surprised by the responses of young easterners. "The younger generation of easterners aren't just falling back into a basic attitude of depression, they're taking initiative," Thomas Petersen, project leader at the Allensbach institute told DW-WORLD. "Their optimism and strength is tangible, and those are the qualities that a region needs to pull itself out of the doldrums." "I gave up a piece of my identity, and because of that, there was this impulse to experience new things, and not to stay stuck in the past," she recalls. "And there were new things, there was a whole new system. I think I'm more free, more independent today because of those changes." But Barwitzki couldn't be more different from fellow easterner Lutz R., a Berliner who was in his early 30s when the Wall fell. As incredible as it sounds to Western ears, Lutz says he felt more free under the East German regime than he does now. "Freedom is relative. In my job now, if I were to complain to my boss about how things are working, I would have to worry about getting fired. For me, that means I'm not free," Lutz told DW-WORLD. "In East Germany, I could say what I thought. Not about the government, of course, but then I didn't have anything against the government. But at work, if I complained to my boss, he'd listen, and I didn't have to fear the consequences." Lutz remembers East Germany as a great country for young people -- a place where he had a steady job, enough food, and a nice apartment located just a few meters from the Berlin Wall. It's presence never bothered him. On the contrary, it reassured him. "The Wall was an anti-fascist protective measure, it was there to protect us from the West," he says. For East Germany expert Klaus SchrÃ¶der, the persistence of such attitudes stems from key decisions made in 1990 when the two Germanys became one. "From the very beginning of reunification, we only thought about the money," SchrÃ¶der explains. "But that was only half the story. We should have also paid attention to the fact that this reunited nation would need to start sharing common values. Back then, everybody thought that those problems would go away if you threw money at them. That's proved not to be true." While few expected reunification to happen overnight, those who experienced the euphoria in 1989 when the Wall fell would probably not have guessed that, in 2004, the gap between East and West would still be so wide. It seems that Germany's best hope of breaking down the "Wall in the head" lies in its young people, for whom the Cold War is an indistinct, childhood memory.